Auto-Sleepers’ new Corinium range, launched at the 2016 February NEC show, makes layouts from its flagship Mercedes-based coachbuilt offering available at a lower price point. This is achieved by building the new Corinium on Peugeot Boxer cabs teamed with Al-Ko chassis. Two models were available at launch: the FB – which mimics the manufacturer’s popular French-bed end-washroom Burford – and the Duo, which carries the twin-single-beds and end-washroom layout of the Burford Duo. An island bed layout is also in development and will join the Corinium line-up in due course. These luxurious new ’vans are designed to appeal to couples, but will sleep four. At 2.35m wide, there’s plenty of space to stretch out in the living quarters. The Corinium certainly looks upmarket, with smart graphics on grey GRP sidewalls, and locker edges trimmed in darker grey, plus a white GRP back panel with a well-arranged light constellation. Standard exterior fittings comprise a barbecue point, a mains socket and a hatch to access underbed storage on the nearside, while an external TV aerial socket and the remaining services are on the offside. An underfloor LPG tank does away with the need for a gas locker and frees up the space for storage. The cab has an opening sky-view window. The FB’s layout comprises a front lounge with parallel sofas, which will appeal to buyers crossing over from a touring caravan, a kitchen opposite the nearside habitation door, next to which is a fridge/freezer and a narrow cupboard with TV and mains points above. A sliding door gives access to the bedroom. The fixed bed is on the nearside with a double wardrobe and dresser opposite. The washroom is at the rear and takes in the full width of the vehicle. On a 60-mile test around the Trough of Bowland in Lancashire, where the roads can be narrow, the Corinium acquitted itself well, proving easy to negotiate along our chosen route. With plenty of power on demand, the ’van tackled steep hills with ease. One consideration, though, is the large rear overhang – care will be needed on ferries. Two large side windows, a rooflight and the cab’s sunroof make the Auto-Sleeper Corinium FB’s lounge a bright and airy space to be. The well-upholstered sofas are made more comfortable with scatter and bolster cushions, and will seat four for lounging and dining with ease. As most buyers will be couples, the lounge offers ample living space. There’s plenty of room for belongings, too, with four roof lockers. Above the cab, two cubbyholes and two lights are mounted on either side. Overlocker lighting adds refinement, while LED corner spotlights and a ceiling light will provide good illumination after dark. Mains and USB points are provided. The offside kitchen is well equipped, with a dual-fuel hob and separate oven and grill, plus an extractor fan to dispel cooking smells. Opposite is the fridge/freezer and above that a microwave. The sink has a detachable drainer and glass top, and there’s a slide-out extension at the front of the unit between the sink and hob to help increase work space. We wonder, though, if a side extension flap might have been more practical. A smart splashback panel surrounds the large window. A crockery set and coolbag are included in the spec. Provision for storing groceries and utensils is excellent, with two drawers (one including a cutlery tray), two cupboards below the worktop and two roof lockers. The area is lit by LEDs and heated by two warm air outlets, powered by the dual-fuel Truma Combi heating system. Although this is a motorhome aimed at touring couples, it can sleep four. The main bed is a fixed double measuring 1.98m x 1.37m, sited against the nearside wall. The front parallel lounge can also be made up into a 2.21m x 1.22m double bed, if required, and doing so is very easy. A large window and a Heki rooflight make the bedroom bright. The fixed bed tapers, so legroom could be restricted, but it has a padded headboard and a comfortable mattress, which is set low. The base lifts to reveal great storage space. Other storage locations in the bedroom include the wardrobe and overhead lockers, plus a shelf and cabinets. The spacious washroom has a separate shower cubicle as well as a rather fancy Perspex hand basin with a swan-neck chrome tap, which sits above a cupboard with a tambour door. Above the basin is a smart piece of tiling, as well as a mirror, soap dish and toothmug holder. Below the window and cupboard sits a swivel cassette Dometic toilet. 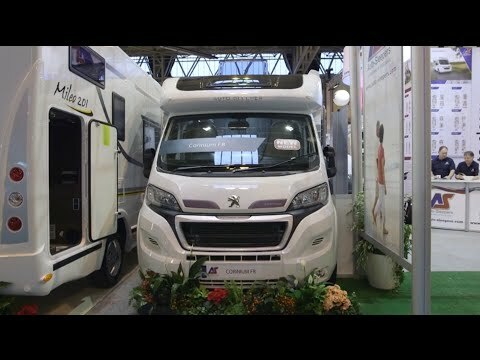 The Auto-Sleeper Corinium FB does not lack places to deploy its user payload – for buyers who need more than 293kg, though, a cost option chassis upgrade to 4000kg is available for £2500. Our test ’van came fitted with the Premium Pack (£2500), which adds an 80W solar panel, Thule canopy awning, alloy wheels, fog and daytime running lights, reversing camera, cab air con and cruise control. It rounds off what is already a generous specification. The spacious Auto-Sleeper Corinium FB is a good-looking motorhome, and feels well made and specified. Whether you’re using a small CL or large touring park, the Corinium will meet your needs. There are a few small niggles, but this looks like being another Auto-Sleepers success. And to see other Auto-Sleeper motorhomes for sale, click here.